-Due to the intensity of the installation, please read entire instruction sheet before beginning installation to prevent any errors. 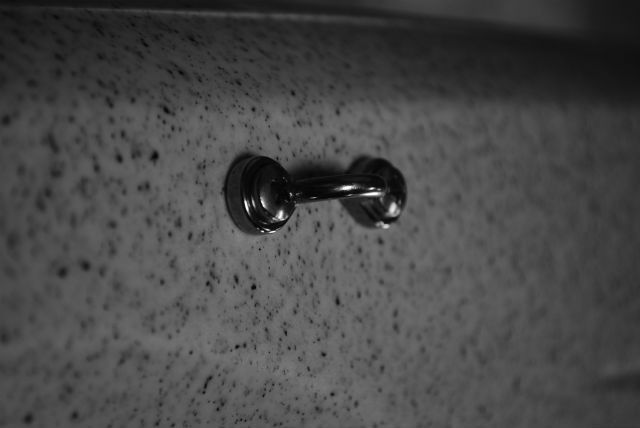 -Use waterproof silicone in any holes you drill EXCEPT where you use wellnuts. -Kayak Specific Tips: This trolley will fit all kayaks. For pulley installation on Viking Kayaks, you will use the 8 small M5 screws provided and mount the pad eyes into the bow/stern brass inserts. For all other kayaks, you will use the long screws and wellnuts to mount your pad eyes. -Trolley system should not be spaced more than 14.5 feet from pulley to pulley. -Our products include unlimited customer support. If you have any questions or concerns, please feel free to email us at sales@yakgear.com. !!! DO NOT USE WATERPROOF SILICONE IN THESE HOLES AS IT WILL MAKE THE WELL NUTS SPIN AND NOT TIGHTEN !!! WHAT TO DO WITH THE EXTRA PAD EYES – Choose one of the following three options – This kit allows you to either 1) install pad eyes for interchangeable trolley use on multiple kayaks 2) install pad eyes for trolley use on multiple sides of one kayak, or 3) install pad eyes for trolley use on one kayak with supplemental anchor line guides. After choosing your method preference, please disregard other the other technique instructions and focus only on the method you have chosen. 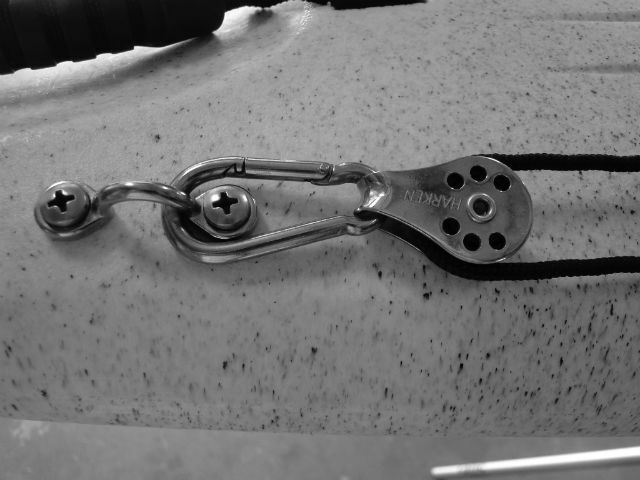 1) INSTALLING PAD EYES FOR INTERCHANGEABLE USE ON MULTIPLE KAYAKS: For interchangeable use on multiple kayaks, the Anchor Trolley should be installed without any Pad Eyes as Trolley Line Guides. In this case, install mirror image pad eyes on your other kayak (as detailed above) and skip the “Pad Eye Installation of Trolley Line Guides” step below. 2) INSTALLING PAD EYES FOR USE ON MULTIPLE SIDES OF ONE KAYAK: For the ability to make the trolley compatible and interchangeable for both sides of your kayak, install the other two pad eyes on the other side of the kayak as a mirror image of the originals and skip the “Pad Eye Installation of Trolley Line Guides” step below. 3) INSTALLING PAD EYES FOR USE ON ONE KAYAK WITH SUPPLEMENTAL ANCHOR LINE GUIDE: Using the pad eyes as a guide for the trolley line, determine placement of the pad eyes by placing one pad eye 1/2 way between your seat area and the pulley on the bow, then repeat with another pad eye 1/2 way between your seat area and the pulley on the stern approximately 3 inches down as you did your pulleys. Make sure to angle the bottom of the pad eyes toward the center line of your boat. This placement being represented as <bow-center-stern>. This angle toward the middle of the boat helps prevent the rope from sagging. Once placement has been determined, use pad eyes as a template to mark drill holes with a sharpie. Drill 1/8” holes where pad eye hole markings were made. Secure screws with a screwdriver and pliers. Always make sure to use Waterproof Silicone wherever you drill except around the pulley wellnuts. Image 2.1. Next, skip the “Pad Eye Installation of Trolley Line Guides” step below. Trolley Line Installation: Clip a carabineer onto each of the pulleys. Image 1.3 Next, clip the carabineers to the bow pad eye and stern pad eye. Loop the trolley rope up through one pulley, down the gunwale of the kayak (through the anchor line guide pad eyes if installed with Option #3 above), down through the other pulley, and center the rope between the two pulleys. Image 3.1 and 3.2. Next, you are going to make a TINY loop for the trolley line to thread through. To do this, grab one end of the trolley rope, loop the rope over onto itself, forming a loop that will only accept rope that is roughly the diameter of trolley line. Crimp the loop closed (Image 3.3), cover the crimps with a piece of shrink wrap(Image 3.4), and heat the shrink wrap. 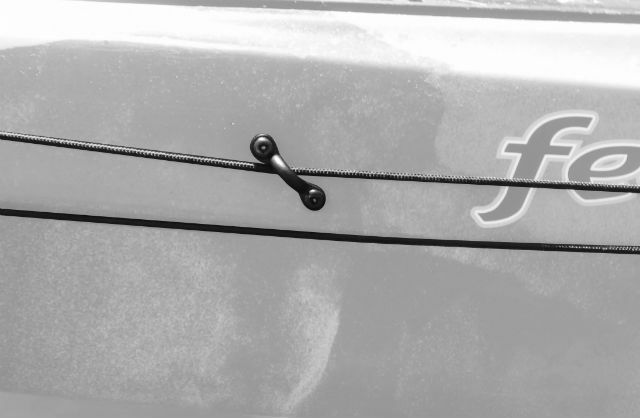 Thread the trolley line through the loop to create a snug fit on your kayak (Image 3.5). 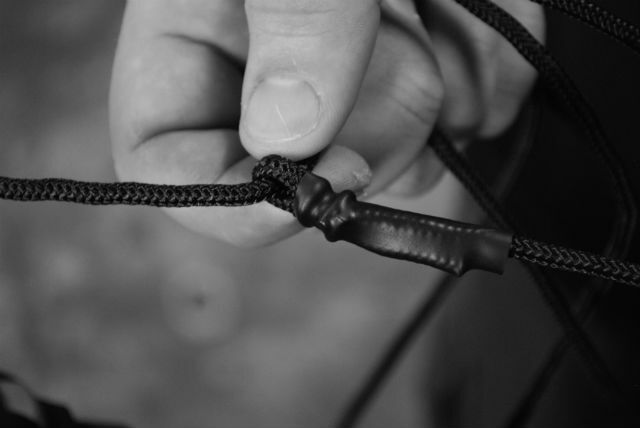 Then tie a double knot to prevent the line from slipping back through the loop (Image 3.6). Finally, reach for the very end of the trolley line and make another (slightly larger) loop at the end of the rope to put the last caribiner on. 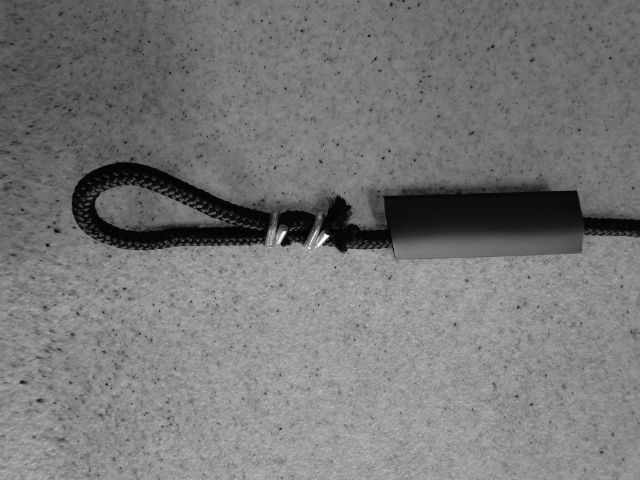 This last carabineer will be used in the free hanging loop to attach to your anchor rope, drift sock, or mud stick anchor.